Dodgeball and rockclimbing … how does it get better than that? The troop visited the local YMCA last week and had an awesome time! 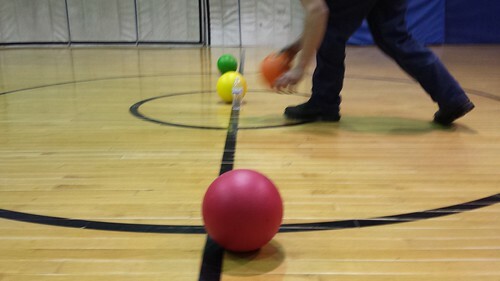 The scoutmasters jumped into several games of dodgeball with the boys who promptly whooped their seniors. Even with their most creative rulemaking abilities, the Hiking Meese showed everyone how dodgeball was really played. 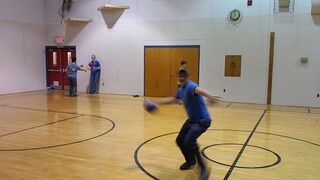 It didn’t matter if it was buddy ball, war ball, or feet only dodgeball, these scouts dominated! After an hour of dodgeball, things get really exciting as the climbing gear came out and the boys participated in rock climbing on the Y’s awesome climbing wall. Seriously, you could get a nose bleed up there! But that didn’t deter our intrepid climbers. 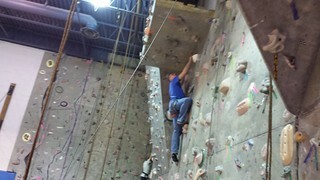 The boys took to the wall like spiderman on a high-rise. While the newer boys challenged themselves to learn the basics, the older boys attacked parts of the wall that even seasoned climbers found difficult. At the end of the night, everyone had a good time and capped off the evening with some pretzels and water that Blake and his family brought for the occasion.